Lease from $125 at 0.99% APR weekly*. 40 months with $0 down payment. Includes freight and fees. HST extra. 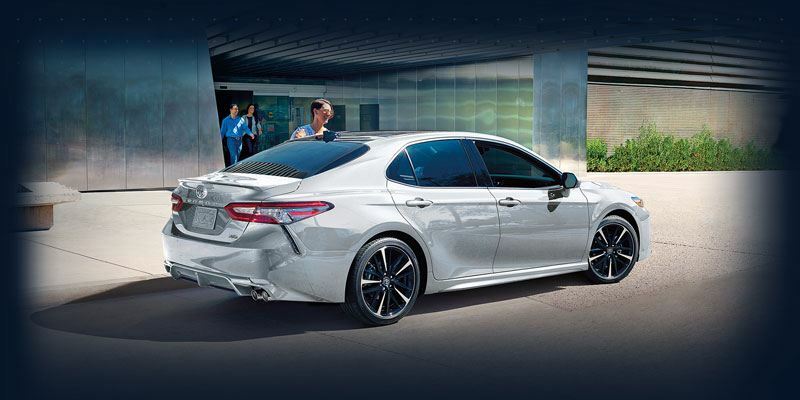 The Camry is sharp, sleek, and constructed with stunning craftsmanship. Built on the Toyota New Global Architecture (TNGA) platform, the Camry features LED headlamps, an extended wheelbase, a wider stance, and a lowered centre of gravity. Camry’s driver-focused cabin is designed to hold you in comfort with controls close at hand. 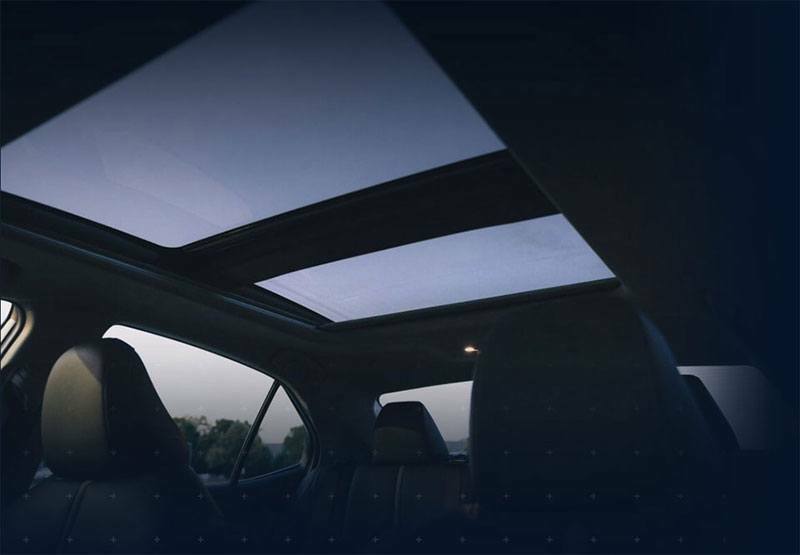 Choose the XLE for leather trimmed and heated front seats, or the SE with heated sport seats, both featuring 8-way power adjustments for the driver, and 6-way power adjustments for the front passenger. Rear seats split 60:40 for added cargo space, and a fold-down armrest for added convenience. 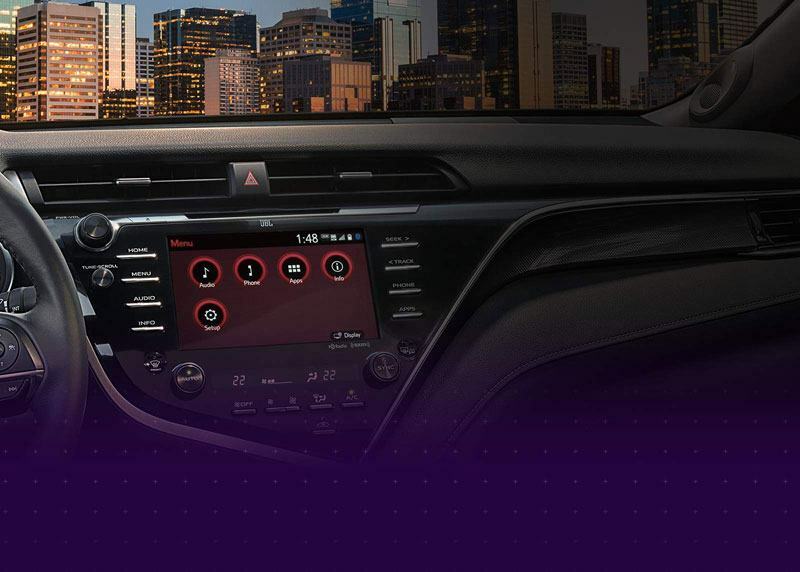 Standard on every Camry, Entune™ 3.0 keeps you connected to the content that matters to you - like the Slacker, Yelp, Sports, Stocks, Fuel, Weather, Traffic Incident News and NPR One apps. With available Entune™ Safety Connect, drivers can take advantage of a stolen vehicle locator, Emergency Assistance (SOS) button, Enhanced Roadside Assistance and Automatic Collision Notification. Vehicles equipped with embedded navigation, also feature Destination Assist, which provides 24-access to a live agent who can help you find a specific location, and send the route directly to your navigation system. For vehicles not equipped with embedded navigation, Entune also features Scout™ GPS Link -- a smartphone based navigation system that sends route information directly to your vehicle’s display screen. 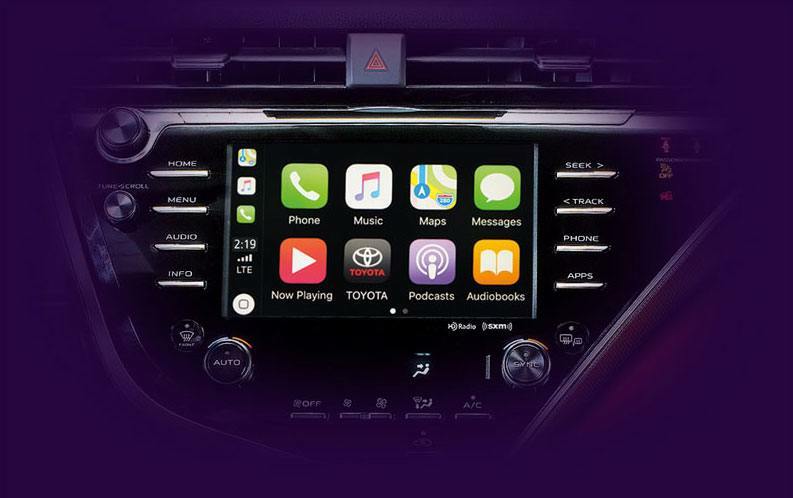 The Camry works with Apple CarPlayTM -- the smart and easy way to use your iPhone while driving. 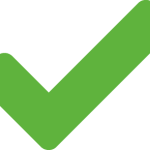 Simply connect a compatible iPhone through a USB outlet, and select apps appear on your vehicle’s touch screen. Using Siri voice commands, steering wheel audio controls, or the touch screen, you can make phone calls, send text messages, call up your favourite playlist, use maps to find the best route, and more -- all while keeping your focus on the road. 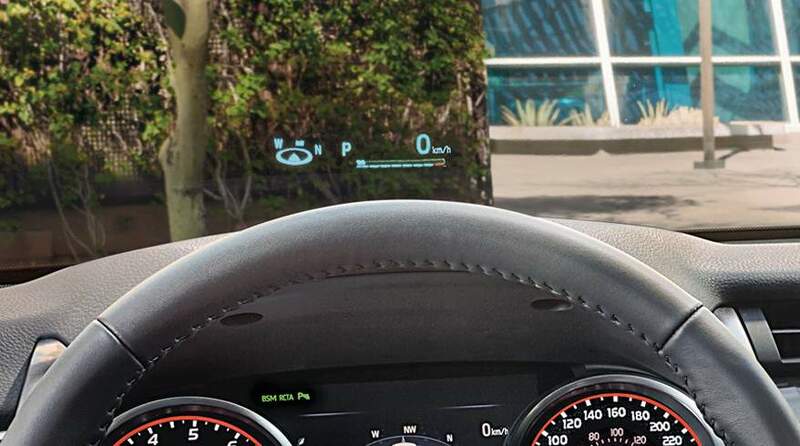 The all-new 2019 Camry and Camry Hybrid now features an available 10" head-up display on the front windshield for maximum driver visibility. 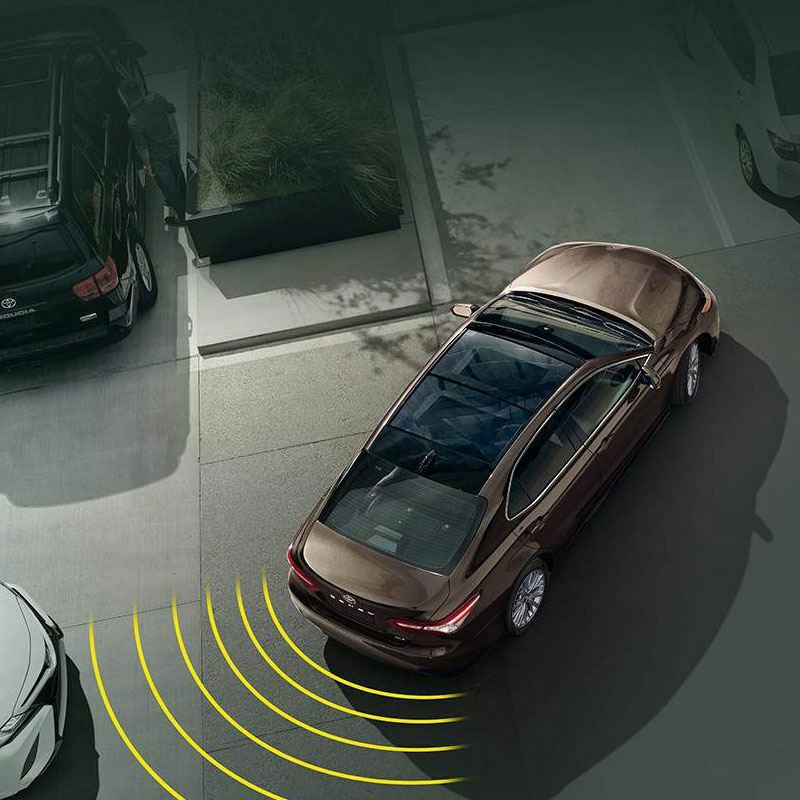 XLE V6, XSE V6, and Hybrid XLE offer this convenient feature that helps to reduce distracted driving. Unlike Electric Vehicles that need to be plugged in for several hours to recharge, Toyota's hybrids never need to be plugged in. Instead, they recharge on the go, using innovative systems like regenerative braking to capture and transform braking energy into electricity that is then stored in the hybrid battery. Toyota Hybrids deliver powerfully efficient performance. They automatically switch between electric-mode only, gas-mode only, or a seamless combination of the two depending on driving conditions. For Camry Hybrid, the result 208 Net system horsepower with fantastic 4.9 L/100km City and 4.8 L /100km† Highway fuel efficiency ratings (Camry LE Hybrid). Toyota’s Hybrid design can help reduce wear & tear on your Hybrid vehicle, such as the fact that the engine is off part of the time while in electric-only mode, and there are no starters, alternators or belts to be replaced. The high performance battery is designed to never have to be replaced. And a Hybrid maintenance schedule is nearly identical to one of our conventionally powered vehicles. 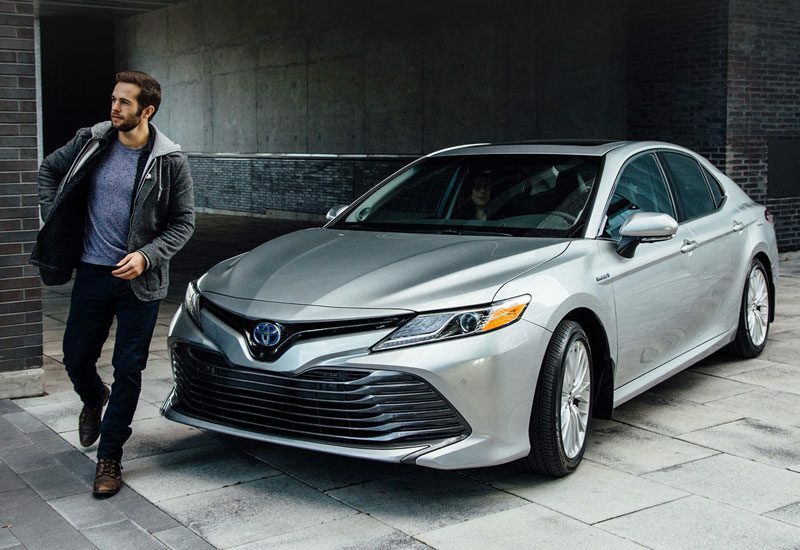 Choose the Camry Hybrid that suits your style. 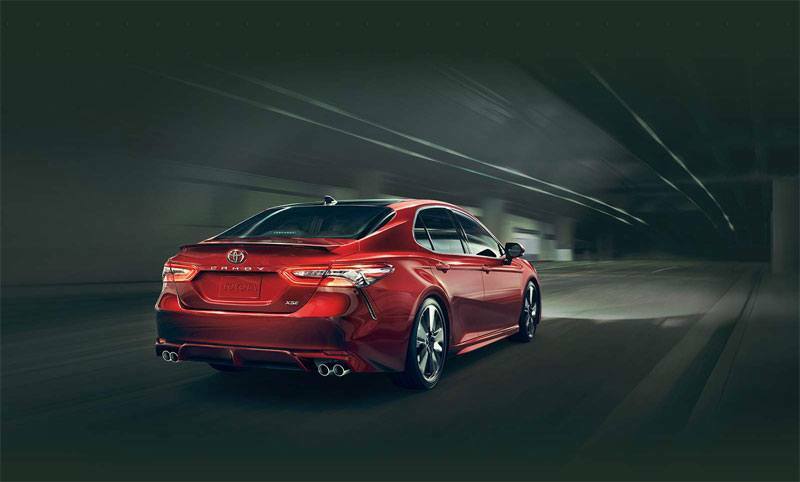 Camry’s new generation of Dynamic Force Engines are more powerful and fuel efficient than ever. The 2.5-litre 4-cylinder produces an ample 203 HP on the LE, XLE and SE, and 206 HP the XSE. For even more spirited performance, the 3.5-litre 6-cylinder that graces both the XLE V6 and XSE V6 delivers 301 HP. For an even more fuel efficient and exhilarating driving experience, Camry’s drivetrain and suspension are fine tuned for reduced vibration. The lower centre of gravity allows for more stability and increased confidence when cornering at higher speeds. Available drive mode select brings versatility to the table with “Sport”, “Economy”, and “Normal” drive modes to enjoy a personalized experience in the driver’s seat. On Camry Hybrid models, the electric power combines with a 2.5 litre 4-cylinder engine that features Atkinson Cycle timing, resulting in greater horsepower and exceptional fuel efficiency. 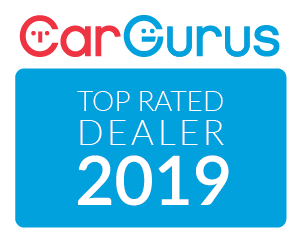 It’s mated to the Electronically controlled Continuously Variable Transmission (ECVT) and also comes with a battery designed to last the life of the vehicle. Best of all, it’s self-charging, so it never needs to be plugged-in. 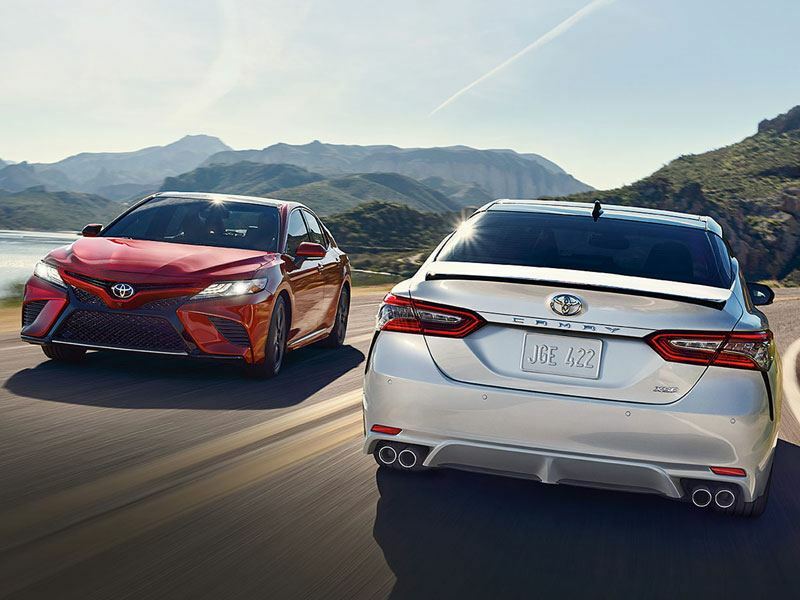 On 2019 Camry Hybrid models, the electric power combines with a 2.5 litre 4-cylinder engine that features Atkinson Cycle timing, resulting in greater horsepower and exceptional fuel efficiency. It’s mated to the Electronically controlled Continuously Variable Transmission (ECVT) and also comes with a battery designed to last the life of the vehicle. Best of all, it’s self-charging, so it never needs to be plugged-in. 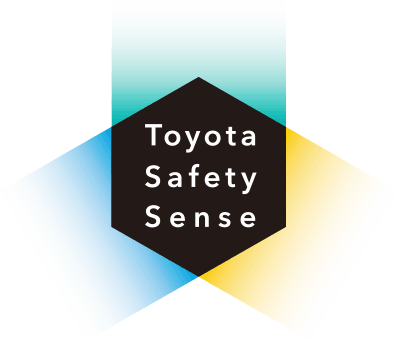 Standard on Camry and Camry Hybrid is Toyota Safety Sense P, which comprises of Pre-Collision System with Pedestrian Detection, Lane Departure Alert with Steering Assist, Automatic High Beams, and Dynamic Radar Cruise Control. Get Today Your Camry at Mississauga Toyota!